Curling Stones for Lego People: (My) Trollbeads Spring Collection has arrived! 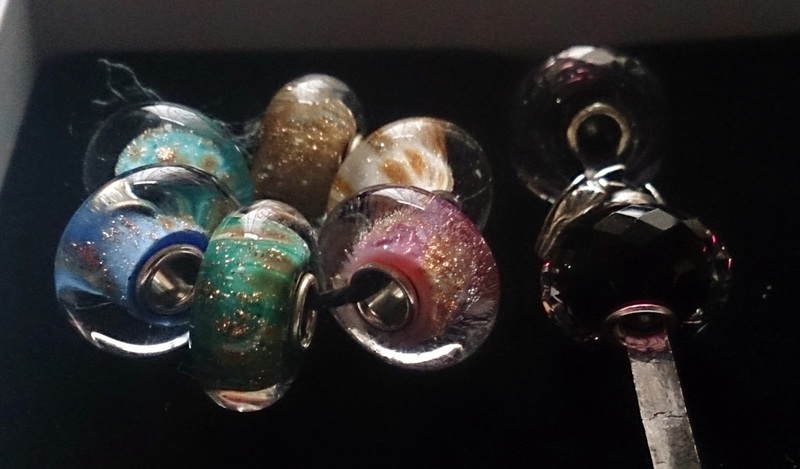 (My) Trollbeads Spring Collection has arrived! Last month saw the debut of the Trollbeads Spring Collection; a collection that I had been eagerly waiting for and have so far resisted the urge to go squee or indeed squeek with excitement; although that is probably the side effect of being laid up with lurgy in the run up to the release launch! Unfortunately due to this, I didn't get to see the collection make it's debut on the day so I set about choosing my beads in a wholly different manner from normal; unusually I didn't hand pick my glass beads by sight either... so I wasn't sure what exactly would arrive through the post. I love opening up the box to find out what delights are contained inside, and even though I obviously knew what I'd ordered (my fever wasn't running *that* high) I never tire of that first sight of a set of beads! I was good this time and did stick to my original list without sneaking in any extras! My first impressions of the Sparkle Kit were good overall, I knew I'd always be a bit self critical for not taking my time to hand pick my choices but I'm not disappointed by my kit either. I can see me picking up multiples in the future as I come across nice examples either in person or by photo, but the general consensus is if you like sparkly beads you won't be disappointed with this kit. Clockwise from knot: Magical Lamp, Scirocco, Desert Rose, Oasis, Fountain of Life, Ancient Palace. The beads that actually knocked my socks off were the Sahara Night Facet ones, I'm not sure my friends understood my enthusiasm for these beads until I showed them some side shots, I've chosen to make a collage of these so you can see how they look from different angles. 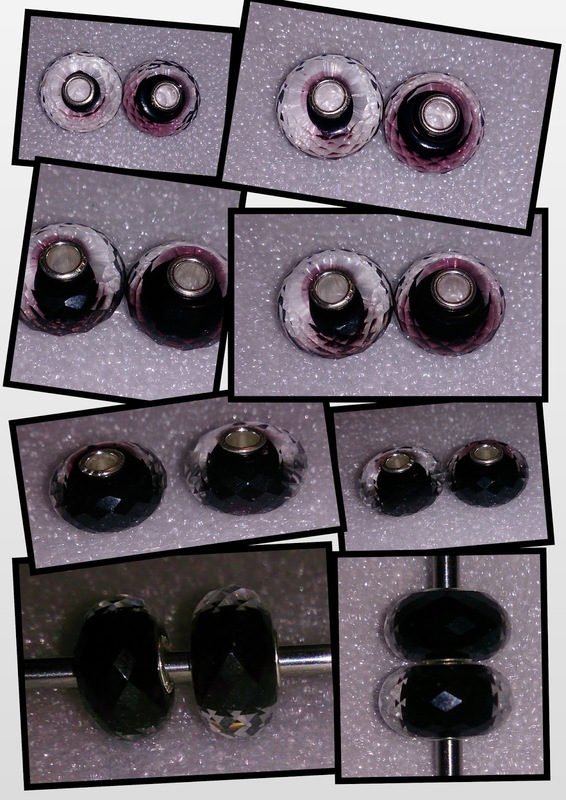 I *love* the berry hue (thanks Victoria for that description) that you see when viewing the beads from an angle. Mine are both different, one has a smaller inner core and large clear overlay and the other has a much fatter core and smaller overlay which changes the way the beads look. For those "must be matched" fans who can't hand pick their beads you might want to ask online retailers to do an overhead shot of the side of your bead/s as well as the normal head on vertical ones on rods to make sure you get the ones you want. Finally my Babylonian Nymph, I love the detailing on this bead! I'm really pleased with my initial choices and a quick peek in my bead box revealed that there are lots of beads I can use with the new arrivals to conjure up some new bracelets, bangles and necklaces. Have you bought any of the new collection yet? Do you plan to? What do you think?? Oh you caught the berry shades better than I did! It never showed in the stock images at all so it was quite a nice surprise for me. I love the idea of a black and berry coloured bracelet for fall (thinking ahead here ;)) Dark red prisms and these facets perhaps? That berry hue is gorgeous! I've got a few ideas on what I wanted to use this bead for, but I haven't got as far as Fall bracelets yet but that would be a lovely idea! I think it's such a versatile bead and one that's been a bit overlooked at the moment in the excitement of the initial release, I think/hope once more people get to see it in real life it will start to come into it's own. 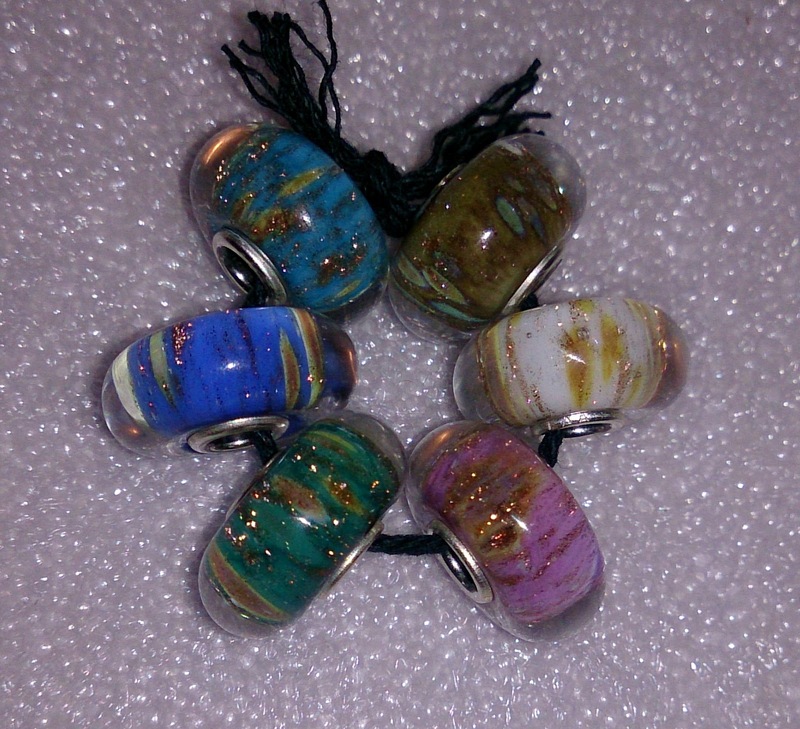 I know I'd like (more) multiples in the future for sure as I love this bead! Just need to reign it in a bit on the spending at the moment; those boilers are definitely getting replaced this year!